Anna is a strong, saucy, certifiable insane, serial killing “ghostess with the mostess”. Since her brutal death, she has killed anyone who has ever stepped into the deserted house she use to call home and was murdered in. Of course, this all changes when she spared Cas Lowood’s life, even though Cas has come to town with a mission to destroy Anna. See Cas has an unusual ability, he can kill the dead. 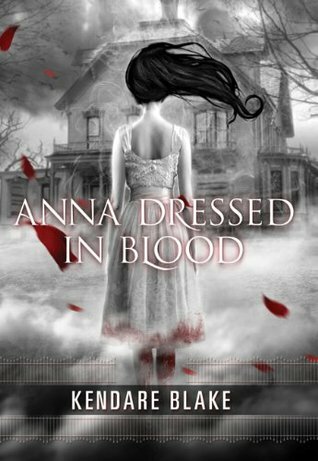 Anna Dressed in Blood by Kendare Blake was sooooo much fun! It was a wild ride but totally worth it. I could not put this book down and probably read it in less than 24 hours. I had thought that this book was going to be scary and sadly it wasn’t. Yet it was so much fun that I am okay with that. This entry was posted in Ghost and tagged Anna Dressed in Blood, Fun Read, Ghost, Kendare Blake, paranormal, paranormal romance, Science fiction, YA Book. Bookmark the permalink.